Commission Regulation (EEC) No 752/93 of 30 March 1993 laying down provisions for the implementation of Council Regulation (EEC) No 3911/92 on the export of cultural goods (2), made provision for a model export licence form applicable to categories of cultural goods listed in annex to Regulation (EEC) No 3911/92. However, this form is not consistent with the United Nations Layout Key for Trade Documents and in practice its use causes some problems. Therefore a new model form conforming to the United Nations Layout Key for Trade Documents should be drawn up. The form should also be accompanied by explanatory notes to help interested parties to draw it up uniformly and correctly. Regulation (EEC) No 752/93 stipulates that the form should be filled in by mechanical or electronic means or by hand. However, in order to reduce the administrative costs, Member States which so wish and have the necessary technical means should be allowed to issue the document by electronic means. 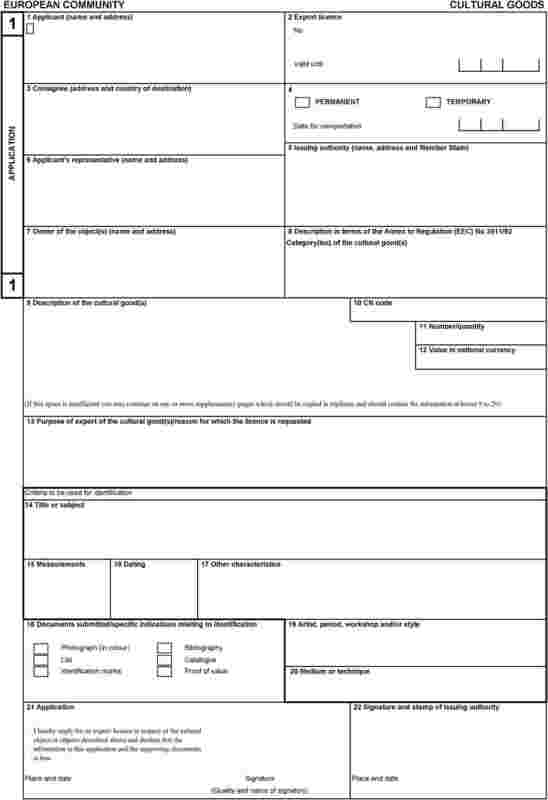 To ensure that the issuing authority receives sheet 3 of the form, provision should be made for the customs office of exit from the Community customs territory to return this sheet directly to the issuing authority instead of giving it to the exporter or his/her representative, as provided for at present. Export licences issued up to 30 June 2004 shall remain valid until 30 June 2005. (1) OJ L 395, 31.12.1992, p. 1. Regulation as last amended by Regulation (EC) No 806/2003 (OJ L 122, 16.5.2003, p. 1). (2) OJ L 77, 31.3.1993, p. 24. Regulation as last amended by Regulation (EC) No 1526/98 (OJ L 201, 17.7.1998, p. 47). Licences are required for the export of cultural goods to protect the cultural heritage of the Member States pursuant to Regulation (EEC) No 3911/92 of 9 December 1992. Commission Regulation (EEC) No 752/93 of 30 March 1993 sets out the form in which standard export licences are to be drawn up. It is intended to guarantee standardised checks on the export of cultural goods outside the Community's borders. general open licences, to be issued to museums or other institutions to cover the temporary export of any of the goods that belong to their permanent collections that are liable to be temporarily exported from the Community on a regular basis for exhibition in a third country. Three copies of the standard export licence form must be completed legibly and indelibly, preferably by mechanical or electronic means. If they are handwritten, they must be completed in ink and in capital letters. They must under no circumstances contain erasures, overwritten words or other alterations. Copy No 3: to be presented at the competent customs office of export and to accompany the consignment thereafter until its arrival at the customs office of exit from the Community; the customs office of exit stamps this copy and then returns it to the issuing authority. Box 8: Description in terms of the Annex to Regulation (EEC) No 3911/92. Category/-ies of cultural good(s): These goods are classified in categories numbered 1 to 14. Enter only the corresponding number. Box 9: Description of the cultural good(s): State the exact nature of the good(s) (for example painting, sculpture, bas-relief, negative matrix or positive copy in the case of films, furniture or objects, musical instruments) and give an objective description of the appearance of the good(s). For category 12 objects: state the type of collection and/or geographical origin. Box 10: CN-code: As an indicator, state Combined Nomenclature code. Box 11: Number/quantity: State the number of items, particularly where they form a set. Box 12: Value in national currency: State the value of the good(s) in national currency. Box 13: Purpose of export of the cultural good(s)/reason for which the licence is requested: State whether the good to be exported has been sold or is intended to be sold, exhibited, valued, repaired or put to any other use, and whether its return is compulsory. Box 14: Title or subject: If the work does not have an exact name, indicate its subject with a summary of the appearance of the object or, in the case of films, the subject. In the case of complex or unusual shapes, indicate the measurements in this order: H x L x D (height, width, depth). Box 16: Dating: Where no precise date is known, indicate the century and part of the century (first quarter, first half) or millennium (categories 1 to 6). For antique goods to which age specifications apply (more than 50 or 100 years old or between 50 and 100 years old), and for which it is not sufficient to indicate the century, specify a year, even if approximate (e.g. around 1890, approximately 1950). Box 17: Other characteristics: Give any other information on formal aspects that could be useful for identification, e.g. historical antecedents, conditions of execution, former owners, state of preservation and restoration, bibliography, electronic code or marking. 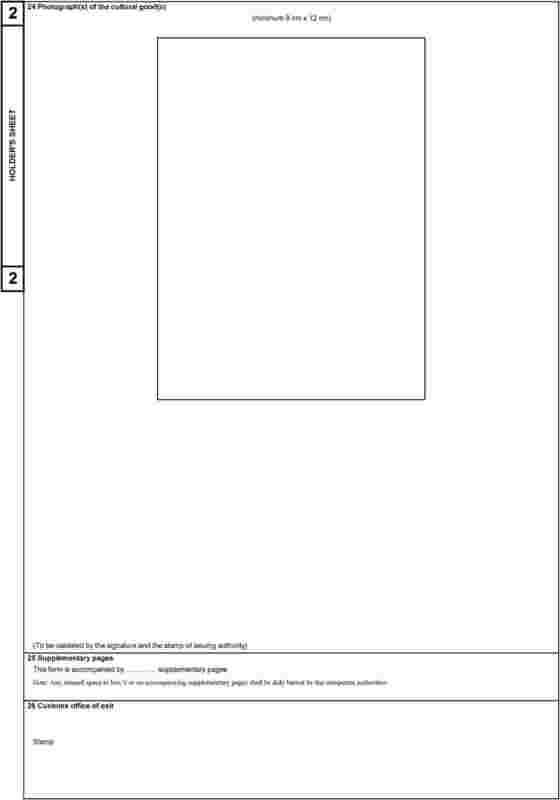 Box 18: Documents submitted/specific indications relating to identification: Indicate with crosses in the appropriate squares. Box 19: Artist, period, workshop and/or style: Give the artist's name if known and recorded. If the works are collaborative products or copies, indicate the artists or the artist copied, if known. If the work is only attributed to a single artist, enter “Attributed to…”. If the artist is not known, state the workshop, school or style (e.g. workshop of Velazquez, Venetian school, Ming period, Louis XV-style or Victorian-style). Box 20: Medium or technique: The information given in this box should be as precise as possible. Indicate the materials used and specify the technique employed (e.g. oil painting, woodcuts, charcoal or pencil drawing, lost wax casting, nitrate film, etc.). Box 21 (Copy 1): Application: Must be completed by the applicant or his/her representative, who must vouch for the correctness of the information supplied in the application and supporting documents. Box 22: Signature and stamp of issuing authority: To be entered by the competent authority, with place and date, on the three copies of licence. Box 23 (Copies 2 and 3): For completion by customs office of export: To be entered by the customs office where the export transactions are carried out and the export licence is presented. means the office where the export declaration is submitted and export formalities are carried out. Box 24: Photograph(s) of the cultural good(s): A colour photograph (at least 9 x 12 cm) must be attached with glue. To facilitate the identification of three-dimensional objects, photographs may be required of the different facets. Box 25: Supplementary pages: State the number of additional pages used, if any.